The Wales National Roofing Training Group (WNRTG) was set up in 2009 and is one of the 10 Regional Roofing Training Groups in the UK. It is a non profit organisation, funded by a grant from CITB. It is in place for the purpose of supporting, organising and co-ordinating roof training at all levels for its members. WNRTG works with the industry for the industry. WNRTG has been established to join like-minded roofing contractors to set up locally-based specialist roofing courses open to all. Training can be provided in Caerphilly or arrangements can be made for a trainer to travel to you. 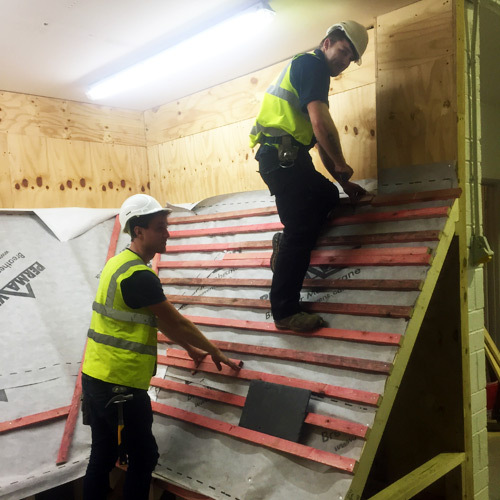 As roofing training is not delivered via the colleges in Wales, WNRTG have set up a practical roofing training centre in Caerphilly where specific roof training and apprentice programmes can be delivered. The main purpose of the group is to aid members in achieving the competency levels required for their business and aim to provide a “ONE STOP SHOP” for all your training needs. We would encourage you to become a member of the Group and keep updated with relevant information and access to funding. We are also now delivering apprentice NVQ 2 Roof Slating and Tiling and NVQ 3 Heritage and lead training Wales and Derbyshire.